In the usual day-to-day grind, I think that it’s easy to ignore the beauty, symbolism, and spiritual awakening that can be found all around us. We remind ourselves of the importance of slowing down, ‘taking it easy’, and even stopping ‘to smell the roses’ all the time. Yet we very rarely have the opportunity to act on these wishes. Our society is set up to reward work ethic and limit doe-eyed dreamers with no more efficiency than a flitting moth. Thankfully, I had the great pleasure this past week of being reminded, in a very concrete way, about the importance of embracing the vibrant, vivid moments which make up the totality of our day. This reminder came via a woman with whom I’d lost contact until very recently – we knew each other in grade school, and through the great power of social media, we were reconnected for dinner and a drink. Samantha Meiler has spent many years paying homage to the absurdity and the awe-inspiring beauty of the world around her through art. With her stylish pink-streaked hair, black pumps, and grey unicorn shirt, she seems to draw in positive energies as we sip our beverages and catch up on common aquaintences. I’m enthusiastic to find out how she’s gotten to where she is in life. 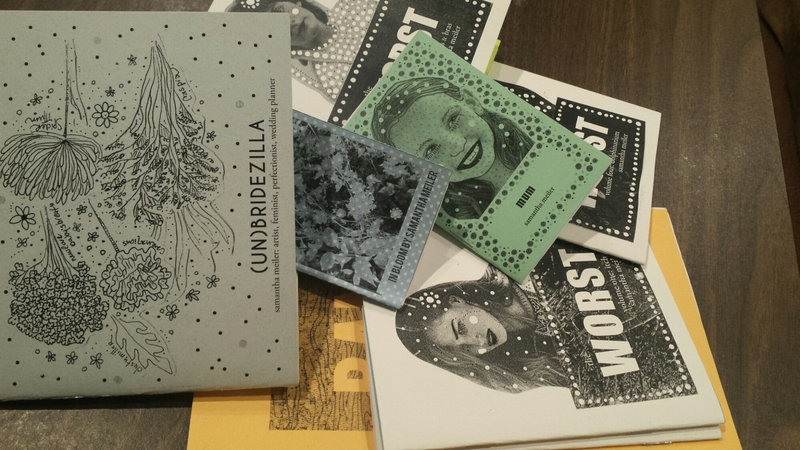 I learn that she planned her entire wedding and produces zines (which are, as Wikipedia tells me, “a small circulation of self-published work”). These are the same kinds of phrases which float through my mind on a daily basis; lost and disjointed, I never take the time to write them down and lose them to forgetfulness. I think my encouragement to stop in your daily routine and truly connect with the world around you is also intimately tied in with a decree to let your heart be open to new and old friends; you may be reminded of important ideas that you forgot, or find new pathways to venture down!